Wow, it has been ten months since I blogged last. I am peeking in today to put up another set of notebooking pages that I have sitting on my hard drive. I believe I have two more sets after this to put up. This set is for the lymphatic and immune systems. If using Exploring Creation with Human Anatomy and Physiology, this would be for chapter 13. Believe it or not, I still have a few more anatomy notebooking sets that I haven't shared. The integumentary system is one of them. Again, I created these to to along with Exploring Creation with Anatomy. Here are some questions, taken from an old book, to think about as you do your study on the integumentary system. Give a brief description of the skin. How does the skin protect the body? What is the structure of the epidermis? How are the nails formed? The hair? What are the uses of the hair and nails? How do they grow? How does the cuticle protect the cutis? Of what use is perspiration? How do we take cold, and what can be done to prevent it? What can you say of the nerves of the skin? 1. The hair, nails, and bits of cuticle and scarf-skin may be examined with a microscope. 2. A magnifying-glass should be used in the examination of the skin itself. The perspiration-pores may be best seen in the palms of the hands. The lecture material (notes and handouts) can be found here. Sometimes when creating or doing a project, I get b-o-r-e-d! That happened with the anatomy notebooking pages. But, I am back!! Today, I have the Nervous System Notebooking Pages which includes a few on the Endocrine System as well. Here are some questions that can be used to help fill in these pages. These notebooking pages do well as a supplement to Apologia's Elementary Anatomy book and their General Science book. 1. Draw a figure of a nerve cell; draw and describe the dendrites. What is the neurite? 2. How many kinds of tissue are there in the nervous system? 3. What are nerve centers? 4. Draw a figure representing a section of the spinal cord. 5. Of how many main divisions is the brain composed? 6. Of what importance are the convolutions of the brain? What is the principal work of the Cerebrum? Of the Cerebellum? Of the Medulla Oblongata? 7. Why does the brain need rest? 1. What are the organs of the nervous system? What is the function of each part of this system? Of the nerves? The cord? The brain? How are nerves classified according to their functions? Describe a nerve. What is a nerve ganglion? 2. Describe the spinal cord. How many nerves join the cord? What two sets of fibers does each spinal nerve carry? Where is the brain situated? Describe the brain. In which side of the brain are located the cells which regulate the action of the right side of the body? 3. Name some of the cranial nerves. What are the meninges? Is the nerve of sight motor or sensory? Is the nerve of hearing motor or sensory? Is the pneumogastric nerve motor or sensory? Classify the spinal nerves as motor or sensory. 4. What is the sympathetic nervous system? What is the function of the cerebral hemispheres? What kind of acts originate here? Can the muscles act if the nerve which connects them with the brain or cord is cut? What kind of acts take place without the use or intervention of the brain? Describe a reflex act. Name some of our actions which are done without our thinking. What occurs in the brain cells whenever we think or perform a voluntary action? 5. Can the brain and nerve system be developed? How? What is the training of the nervous system called? What are habits? What is the chief end of the study of mathematics and grammar? Why should we read good books? When does the nervous system rest? Object of study. The mind is trained by the study of mathematics, language, physics, philosophy, to develop its powers of reasoning and thinking. It is not so much the facts which the child learns as the habits of quick and accurate thinking which count. With these habits he is in a position to make the most of the knowledge and experience which he acquires later. If he has gained the habits of accurate observation and of perseverance and industry, he is well equipped for his progress through the world. Education is by no means confined to the schools. The greater part of it is obtained in the home and in the community about us. At home the boy is given good books, that he may read of the good deeds and noble lives of the world's history. He is taught courtesy and charity, that he may make those about him happier. He is taken to walk in the woods and fields, and instructed in the story of the rocks and plants and animals, that he may come to love nature and to find an interest in studying its works. He is taken to see great works of art and to hear good music, and taught to care for poetry, that he may acquire refined tastes and see more of the grace and beauty in life. In this education it is not enough that children shall read books or see paintings or sculptures. They must be taught to appreciate the meaning which is in the work, to feel the spirit which inspired the writer or painter who conceived it, and to understand the thoughts and ambitions and passions which have molded the lives of the men and women who have made the history of which they read. If they learn these things, to them life becomes filled with an interest and a joy which can never die. A most important habit to acquire is that of self-control. It is this quality perhaps beyond all others which distinguishes manhood. The emotions of sympathy, love, pity, enthusiasm, religion, are all excellent elements of our characters. They help to ennoble us and to lead us to strong endeavor, high thought, and worthy action. But they lose much of their usefulness if they are not controlled by judgment and a sense of justice and right, so that they are allowed to sway us only for the greater good of those about us. More especially should the passions of anger, jealousy, sensuality, and the many ignoble impulses which arise from the desire of possession be controlled. In the submission to these lies a great part of the woe and crime which darken the pages of history. True happiness comes not through the gratification of the desires for the material things of the world about us, but from the possession of a well-balanced mind which can discern the real treasures of life, and a spirit inspired with the pursuit of truth. Everybody has affinities for truth and culture. If they are developed the man will take his pleasure in good pursuits; if not, he will indulge in sensual pleasures. Everybody should be athletic, but he should also be clever and refined. In these days a clever head and a well-trained mind will accomplish far more than muscular strength. Okay, here is the link for the Nervous System Notebooking pages. Links to other websites for lesson plans, quizzes, experiments, etc. 1. Cross one knee over the other, and let the leg hang loosely. Strike the upper leg sharply with the hand just below the kneecap. The lower leg will jerk suddenly forward. This is an example of a muscular movement occurring without the intervention of any thought upon the part of the individual. 2. Tickle the nose with a feather. The sneeze which follows is a reflex act of the body to rid itself of the source of irritation to the mucous membrane of the nose. 3. Pass the hand rapidly close to the eyes of the student next you. The rapid winking of the lids is an example of an involuntary action established to protect the eye. 4. Note the deep and rapid respiration which replaces the ordinary respiration after exertion, as running. This is an automatic action in response to the need of more respiratory exchange to supply the increased combustion resulting from the increased muscular action. I made these to go along with Exploring Creation with Human Anatomy and Physiology, so they are simple. Are y'all ready for a new set of anatomy notebooking pages? Let's go for the heart! Here is a set of Circulatory/Cardiovascular Notebooking Pages. I also added the red blood cell advertisement and graham cracker heart pages. Here are some questions to think about as you do your study on the cardiovascular system. Describe the red blood corpuscles. What is the use of the white blood corpuscles? What is the duty of the heart? What are the arteries? Veins? Do any of the arteries carry impure blood? How can we tell when an artery is cut? What should be done in such a case? Why is such a cut more serious than a cut vein? How does nature stop bleeding from wounds? If the blood would not clot, what would happen when a person is cut? What is the pulse? Why does a physician count a patient's pulse? What is fainting? What is the remedy for it? How is the flow of blood regulate? How is the amount of blood that each organ receives regulated? Why do we feel warm after running? Text on the Circulatory System - There are more under 'Blood and Circulation' on this page. Lesson on the Circulatory System. Lots on the Circulatory System - Flash, pdf worksheets and more. Click on the grade level on the left. Great for those who are doing this study with younger kids. Heart and Circulatory System Activities - Lots of hands on. Great for younger crowd. Lots to choose from on this website. 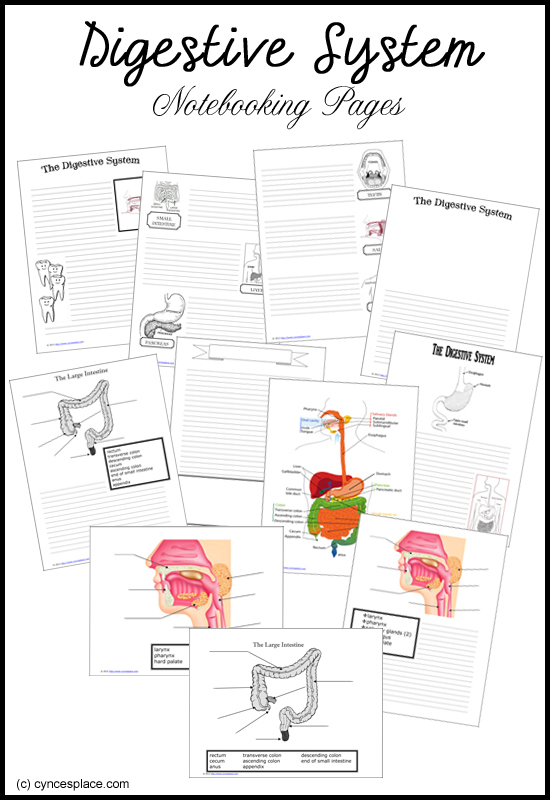 The next set of anatomy notebooking pages is the Digestive System. I added a comic strip notebooking pages for those who are using the Apologia Elementary Anatomy Text, and for those who would like to add it to their studies. Here are some questions to think about as you do your study on the digestive system. 1. What is the alimentary canal? 2. What processes take place in it? 3. What is the purpose of mastication? 4. Describe the teeth. Name them. 5. Describe the structure of the teeth. 6. What can you say of the care of the teeth? 7. What glands are located in the mouth? 8. What do these glands secrete, and what are the properties of these secretions? 11. Name and describe the coats of the stomach, and tell the use of each. 12. What is the gastric juice, and what is its use? 13. What is known of the movements of the stomach? 14. Describe the process of stomach-digestion. 15. What is the chyme? 16. Describe the small intestine. 17. What is the pancreas? 18. What can you say of pancreatic digestion? 20. What is known of the bile and its action? 21. When does absorption take place? Digestive System Project - Cut out and put together the digestive system. Label and explain what each organ does. Digestive System Lessons with Experiments - This site has a few simple experiments that use everyday supplies. Food goes in, then what? Find out in this video. I thought this poem was cute. and started a process that this song’s about. with saliva and juices, all triggered by smell. and into the esophagus for its long journey south. and took my big meatball where the pH is low. were mixed with the meatball by churning again. passed it to the intestine where the pH is high. along with the liver’s bile has much work to do. and broke down my meatball with nary a quirk. are all that is left from my meatball it’s true. and nourish a cell that has nutritional needs. was sent to the colon -- which removes water with zeal. remember my meatball and these processes. Independence High School in Charlotte, NC. It has been a while since I added some anatomy notebooking pages. So, today I have a set of Respiratory Notebooking Pages. Here are some questions to think about as you do your study on the respiratory system. 1. What are the organs of respiration? 2. Describe the larynx, trachea, and bronchi. 3. Give the location, size, shape, and structure of the lungs. 4. What are air sacs? 5. Describe the covering and lining of the lungs. 6. What is the diaphragm? What has it to do with the circulation? I added a notebooking pages on smoking for those who are using the Apologia Elementary Anatomy Text, and for those who would like to add it to their studies. Here it is a video version. This week's set of anatomy notebooking pages is on the muscular system. They are basic and can go along with any study on the human anatomy. There are seven pages in this set. Feel free to let me know if I left anything out. You can find other links and videos on my Muscular Lapbook page. Today, I have some The Skeletal System to add to our anatomy notebooking pages. I could have kept going with this set, but finally had to stop myself at 19 pages. The notebooking pages with labeling, I added images already labeled at the end for your convenience. You can find lots of helpful links and video on my Skeletal System Lapbook page. I decided to add some science notebooking pages. Again, we are using Jeannine's Exploring Creation With Human Anatomy & Physiology, but they can be used with any science curriculum you are using. In this download, you will find a cell notebooking page with the terms of what makes up a cell. The student can then define or describe each term. There is also a place for the student to draw and label a cell. The space provided above can be used for narration or any other information they want to include on cells. Let me know if you would like anything else on cells that I might have overlooked. You can find plenty of other resources on my Cell Lapbook Page.